Yoga is a way to access spirit through the body and the breath. I have been greatly influenced by the vinyasa flow and heart-moving style of yoga I delved into in my teaching certification at Laughing Lotus Yoga Center in 2002. In 2015 I completed my advanced 300 hour training with Saul David Raye/Atma Yoga where I steeped myself in the practices of Bhakti Yoga, Tantra Yoga and Ayurveda. I am now certified as an E-RYT 200, RYT 500 (experience registered yoga teacher at the 200 hour level and registered yoga teacher at the 500 hour level). My other teachers include Seane Corn, Hala Khouri, Suzanne Sterling, Johnathan FitzGordon, and Cathy Calderon. From these teachers I have gained invaluable knowledge about yoga and social justice, trauma-informed yoga, healthy alignment, yoga for back care and about the healing power of movement, music, prayer and ritual. My objective is to create experiences where students can heal, transform themselves from the inside out, and deepen their connection to breath, body and spirit. I strive to create a safe space for people of all genders, races, abilities and sizes to practice yoga in a supportive environment. As a teacher, I am playful, thoughtful, and open-hearted. My practice of Bhakti yoga and kirtan, dance, and Reiki greatly inform my teaching. Through a mix of vinyasa, pranayama, restorative, chanting, and yogic philosophy, I balance flow, breath-centered movement, and healthy alignment to help students move through physical and emotional challenges and to attune to their own wisdom. I am honored to share my curiosity, fascination and love of movement, music, and magic-making with my students and peers. Check out my 14 minute Calming Yoga Sequence video on YouTube by clicking here! My yoga class for people of color was featured in articles on elle.com and on blackenterprise.com! This class is co-taught by a rotating roster of teachers. 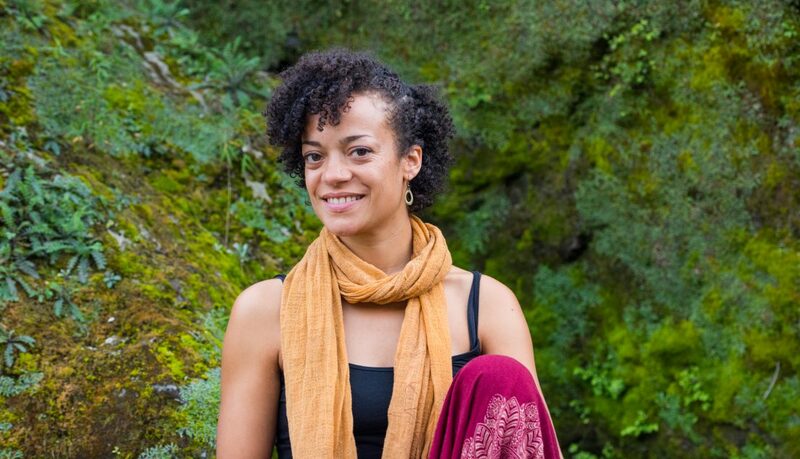 Calia will be teaching on October 6th & November 3rd. Brown Sugar is a yoga and mindfulness practice for people of color, as well as a community in NYC. We offer nurturing, flowing yoga classes to help people of color connect deeply to ourselves and others, learn tools for reducing stress and trauma, and build resilience and joy. Each class begins and ends in a circle where everyone is invited to share and reflect. We always work with an intentional theme – and never close without enjoying some delicious chocolate together. Brown Sugar is taught collaboratively by compassionate and experienced teachers, who are committed to holding space for people of color to move, breath and circle together in mindful yogic practices. The magic of this class is created by the energy of each person who enters this sacred space. This is a body-positive, queer friendly space. All experience levels, sizes, abilities, gender identities, and ages* are welcome – and celebrated! We intend to provide a healing and empowering affinity space for people of color, recognizing that often when black, brown and indigenous people show up to yoga in the US we may be the only one, or one of just a few – or we may not show up at all. Brown Sugar is a space for people of color, because the racism that exists in our society also shows up in yoga spaces, and can be yet another source of stress and (re) traumatization. We aim to provide a warm, nurturing yoga class and community that centers on people of color. *Please note that we are not able to provide childcare at this time. While children are not prohibited from attending, the content of these classes will be geared toward adults and teens. If your child attends the class with you, there is a lobby where you can go together if they need a break from the practice space. Get in touch! Click here for more info or email us at brownsugaryoganyc@gmail.com. Third Root is located at ground level with one step up to our main entrance and no steps at our wheelchair and scooter accessible entrance (please call ahead to arrange for someone to open the door). Our Community Room space where most programs occur is accessible for wheelchairs & scooters, as is our upstairs private treatment room. However, our bathroom is not wheelchair or scooter accessible. As a stop gap measure, accessible restrooms are available to our community at Flatbush Food Co-Op,1415 Cortelyou Road. When we only practice yoga on our mats, the benefits can be limiting. We may perfect our asanas, strive to do more advanced postures, deepen our ability to steady and quiet our minds in meditation, and heal our bodies significantly. But we may not realize the potential of the practice to affect us on multiple levels – personal, interpersonal, in our engagements with community or our activism for social change. This 8-week series is designed to develop and sustain your unique contribution to a more compassionate and just society using yogic philosophy and social justice principles. We intend to create a supportive space to enable yogis and activists to develop new knowledge and tools for self-inquiry, to deeply connect to your purpose, and explore how you can better collaborate for lasting change in a more conscious, sustainable, and joyful way. We will combine practices of meditation, asana and chanting rooted in the different paths of yoga, alongside reflective work and exercises rooted in social justice theory and practice. You’ll leave with new or deepened skills in conscious activism, service and collaboration. At this moment we are all called to find our unique contributions to healing the deep divides in our society; to harness the resolve and passion of a wider segment of the population towards conscious activism that challenges power abuse and supports the whole. This course is designed to guide you toward new ways of engaging in change-making from the inside out. Investment: $360 – $600 Sliding Scale, Pre-Register at $480 (call 718.940.9343 to apply your sliding scale rate). PLEASE NOTE: This program is sponsored by Third Root and will be held off-site at MINKA. Please sign up by April 6th. All materials included in fee.